We love all the heart-shaped and sparkly sprinkles out there for Valentine's Day, and we love baking projects the kids can help out with--so we REALLY love this Family Kitchen recipe that combines the two. 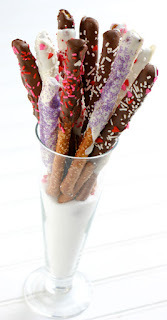 The dipped pretzels are easy to bring to school for class parties or have out on the counter for after-school snacks. 1. Melt almond bark in microwave according to package directions. Dip pretzels in chocolate. We spooned the chocolate onto the pretzels to get the pretzels more covered in the chocolate. 2. Sprinkle with candy sprinkles right after dipping pretzels in chocolate. Lay on wax or parchment paper and let harden. Try out the recipe this weekend and let us know what you think!